Fairmont Le Chateau Frontenac on a summer night. Photo by Sue Frause. It seems a bit risky to rehab a grande dame such as Fairmont Le Chateau Frontenac. 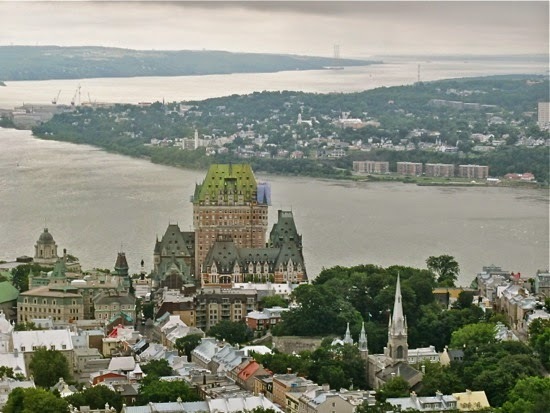 For more than a century, this castle in the sky has loomed high above the St. Lawrence River in Quebec City, welcoming guests from around the world. The hotel got its start in the late 19th century, when Canadian Pacific Railway began construction to create the ideal stopover for its train travelers. Fairmont Le Chateau Fronteac's name is from the flamboyant French goverenor Louis de Buade, Count of Frontenac, who led the New France movement from 1672-1698. His coat of arms may be seen on the entry arch of the outside wall and in other areas throughout the hotel. 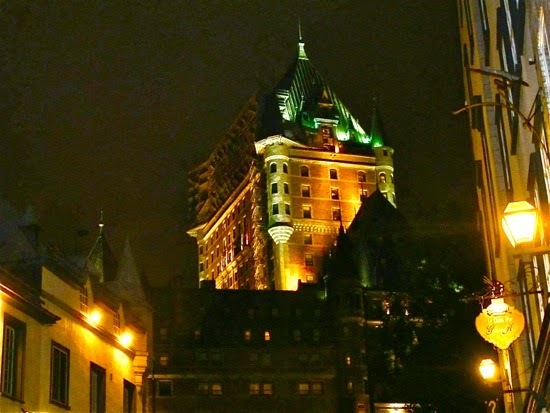 Fairmont Le Chateau Frontenac rises high above Old Quebec, a UNESCO World Heritage Site. Although there have been numerous expansion projects over the years, the hotel is currently undergoing a $70 million revitalization and modernization. An important element in the renovation is the preservation of its heritage. The Fairmont Le Chateau Frontenac sits on the sites of the Saint-Louis Forts and Chateaux that were the official residence and seat of power of the French and British governors for more than 200 years. While transitioning the hotel's interiors to a more contemporary style, designers will be respectful of the hotel's history while combining historical and modern elements. That will be showcased through heritage elements and positioning of 400-year-old artifacts within specially designed windows. 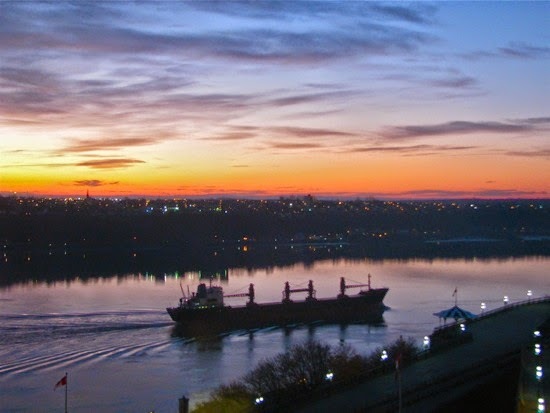 Sunrise on the St. Lawrence River from the Fairmont Le Chateau Frotenac. Photo by Sue Frause. Transformation of the main lobby. Renovation of the hotel's 611 guestrooms. Of those, 354 will have a more contemporary design, while the other 257 will offer a classic Chateau style. Construction of a new floor of Fairmont Gold rooms, increasing the number from 46 to 60. The Gold Lounge will also be expanded. Addition of a luxury spa and expansion/renovation of the health club. Opening of the new 1608 Wine & Cheese Bar, featuring 250+ local cheeses and an expansive wine menu. Le Sam, a newly created bistro-style restaurant. Continuation of masonry and roof replacement work. It's anticipated that the project will be completed by June 2014. "Inspiration renderings" and other details of the renovation are available at nouveauchateau.com and a virtual tour may be found here.